Growing up with a rhubarb patch next to our patio in South Dakota, I thought everyone had summer childhood memories of dipping crunchy rhubarb stalks in sugar, drinking rhubarb juice, savoring rhubarb crisp for the 4th of July and licking rhubarb popsicles on a hot humid day. Now as an adult, I realize that the benefits and versatility of rhubarb are not common knowledge. Enjoy learning the three best-kept secrets of rhubarb. Since rhubarb grows best from roots and crowns, rather than seeds, plant roots in early spring. Because rhubarb is a very forgiving plant and can withstand quite a bit of neglect, plant it in a place you don't mind it coming back for 10-15 years. If you live in an apartment, rhubarb can even grow in a pot. You can enjoy rhubarb all summer, if when harvesting, you leave the three tallest stalks with the largest leaves to shade the base of the plant in the hot sun. The rest of the stalks, cut about 1/2 inch from the ground. Since the leaves are toxic, cut them off and discard. If you want to expand your patch, every fall you can divide the roots of your plant and use that as a starter for a new plant or give to a friend. Rhubarb can be bright pink, red, or even pale green. Even though color is not an indicator of ripeness or sweetness, my German husband insists that we wait to pick our pale green rhubarb until it turns red. Since I harvest my rhubarb about five times each summer, it's amazing what a dash of red food coloring or adding a few strawberries can do when I make a ruby red rhubarb sauce - my husband doesn't even know the difference! How many foods do you know that contain only 26 calories and zero grams of fat in one cup? However, since rhubarb itself is excruciatingly sour, it is often cooked with sugar that contains empty calories. One can cook rhubarb with other sweeter fruits, such as strawberries, pears or apples, to help sweeten the rhubarb naturally. The 2.2 grams of fiber in each cup of rhubarb (100 grams) is important for decreasing cholesterol and good digestive health. If you are trying to lose weight, rhubarb, like many vegetables because of their fiber, can help you keep fuller longer. 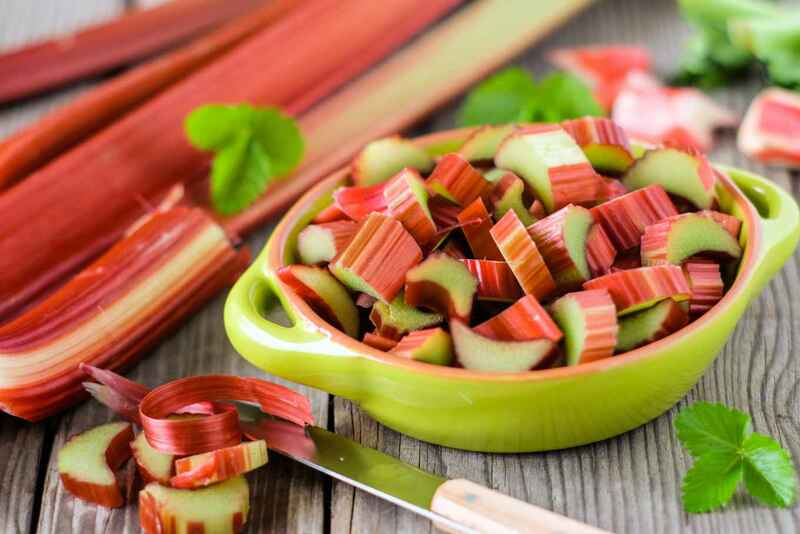 One small study demonstrated that men with high cholesterol who ate 27 grams of rhubarb every day for a month decreased their LDL (bad) cholesterol by 9%. Note, that this benefit is not exclusive to rhubarb fiber, but other vegetables are just as effective. Another good reason to fill half of your plate with fruits and vegetables! Have you ever wondered why different letters are chosen for the names of vitamins? Why do we have vitamins A, B, C, D... K? Vitamin K is very logical. A German-speaking scientist who first identified the role this vitamin played in the coagulation or clotting of blood after a wound, named it vitamin K from the German word "koagulation"
Not only is vitamin K important in its function in blood clotting, some epidemiological studies have shown that even though the calcium intake is low in some Asian countries, the osteoporosis rates are low. Recent research has shown that one potential reason may be due to the high amounts of vitamin K in natto (a traditional Japanese food made from fermented soybeans). Because vitamin K is a fat-soluble vitamin and your body does not excrete it as quickly and easily as water soluble vitamins, there are health risks associated with excessive vitamin K. Thus, as dietitians almost obsessively preach, obtain your vitamins and minerals from foods not from supplements. Note: For people on Warfarin (Coumadin), it is important to keep the vitamin K levels in their bloodstream consistent. Sudden swings in vitamin K can affect how quickly the blood will clot or not. Thus, one should monitor the vitamin K foods one eats and try to eat the same amount of these foods every day. Even though on a food label, one can see that one cup of rhubarb provides 10% of the recommended amount of calcium, which means it provides 100 mg of the recommended 1000 mg of calcium recommended each day, much of the calcium in rhubarb is bound to oxalic acid and the body cannot absorb it efficiently. Thus, a lot of rhubarb would be needed to be eaten for the equivalent amount of calcium found from other sources. Warning - not all vegetables are good sources of calcium. Other vegetables that are healthy to eat, but not great calcium sources because of other substances that interfere with calcium absorption are spinach, beet greens and Swiss chard. Because of its vibrant red color, rhubarb contains the antioxidant, lycopene, which may help decrease your risk of cancer. Interestingly enough, lycopene is stored in the walls of the rhubarb; thus, lycopene can be better absorbed when it is released after the walls of the rhubarb are broken down during the cooking process. This is similar to tomatoes in which canned tomatoes have a greater lycopene content than raw tomatoes. Secret #3 - Cheap and versatile to use. Be inspired with these savory or sweet healthy rhubarb recipes. Click on Pinterest healthy rhubarb recipes for mouth-watering pictures with recipes. Watch this quick video by a registered dietitian for Zesty Rhubarb Chutney for fish, chicken or pork. Be motivated to freeze extra rhubarb. Remember that you can use rhubarb all year long. If rhubarb is taking over your garden or you find a cheap sale at the farmer's market, it is easy to prepare raw rhubarb and freeze it. Step 1: Remove leaves and wash stalks. I usually fill the sink with water and scrub them gently. Step 2: Cut stalks into about 1/4 inch pieces so you can easily mix into muffins or coffeecake. Step 3: Put 2 cups of rhubarb into small freezer bags. Freeze. Step 4: Use at a moment's notice frozen (for smoothies) or thaw in the microwave. Enjoy making this simple rhubarb syrup and sauce. Great for summer rhubarb mojitos or as a topping for ice cream or sherbet. Bring to a boil. Once it is boiling, turn down the heat and let it simmer about 20 minutes, until rhubarb is soft and liquid has slightly thickened. Let simmer longer for a more concentrated syrup. Ladle the mixture into a fine meshed strainer over a heatproof bowl. Pour the syrup into a clean jar and refrigerate or freeze. Makes about 10 ounces. Enjoy the rhubarb sauce leftover in the strainer, which has a similar consistency to applesauce. Mix into low fat plain yogurt or use as a topping for pancakes or French toast. In summary, you are now in the know about the best-kept secrets of rhubarb. Please share your favorite rhubarb recipes below. Move Your Pumpkin from the Porch to the Kitchen!